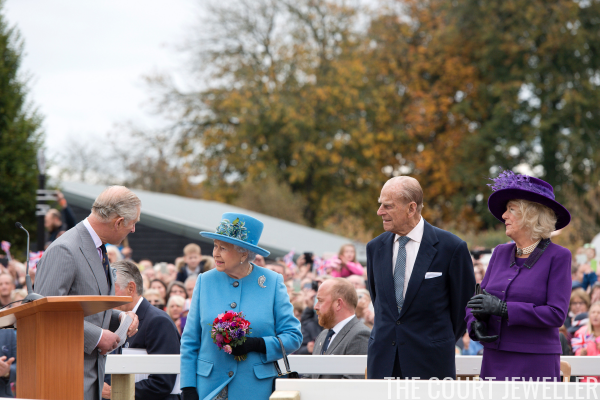 Poundbury is an experimental community located on land owned by the Duchy of Cornwall, and Prince Charles has been instrumental in its planning and design. 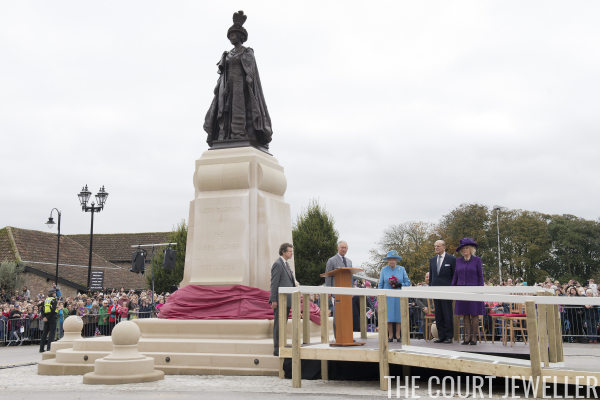 No surprise, then, that there are several places in Poundbury named for the important women in his life, including the Queen, Camilla, and the Queen Mother. Today, the Queen unveiled a statue of the Queen Mother; it's a second casting of the statue of the Queen Mum that sits on the Mall in London. The statue is the centerpiece of a square named for the Queen Mother, and fittingly, lots of the surrounding buildings are named for her favorite racehorses. Also fitting: the Queen's brooch choice for the unveiling. 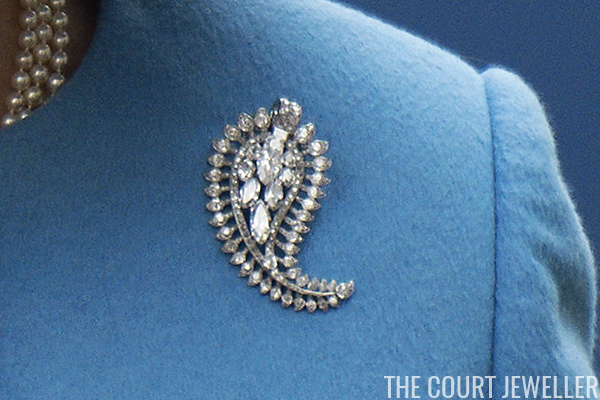 She wore her mother's diamond palm leaf brooch, which was made by Cartier in 1938. 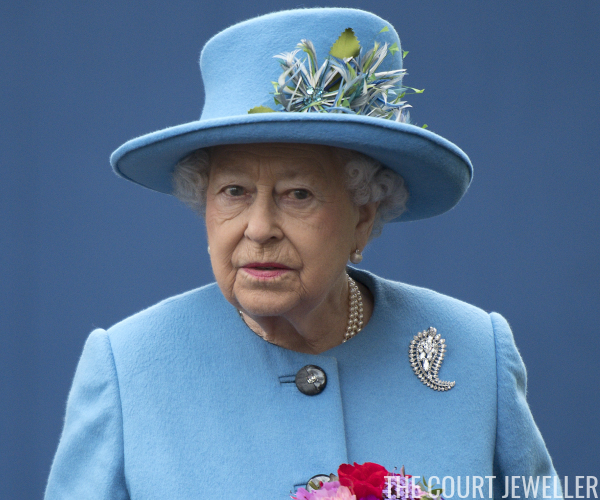 The Queen Mother commissioned the piece herself, and it was made using loose diamonds from her collection. Here's a nice close-up view of the brooch. Many have noted that the piece also resembles a paisley element, but in this view, you can see the way the diamonds mimic the edges of a palm frond. The Duchess of Cornwall was elegant in diamonds and pearls for the visit, including her four-stranded diamond necklace with the large diamond cross clasp. 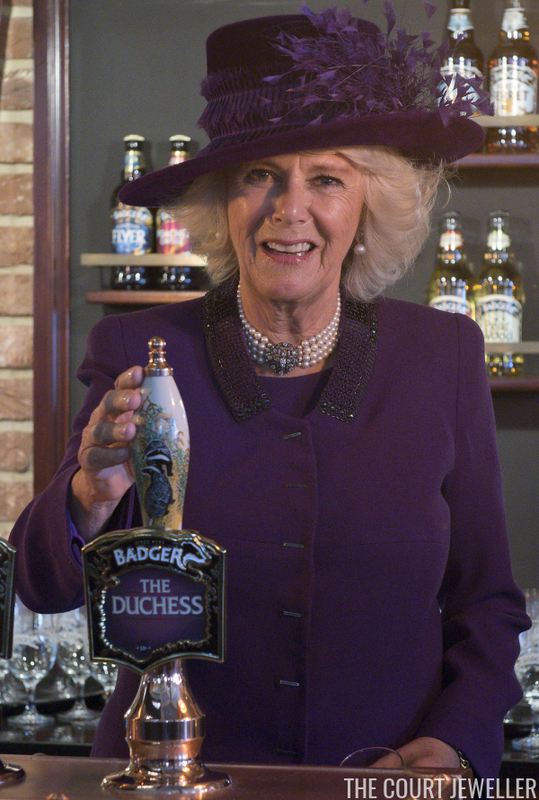 Above, she's visiting her namesake pub in Poundbury and, of course, pulling a half-pint of "The Duchess" ale. I think the pearls were a great choice with this outfit, but I was sort of disappointed not to see her wearing one of the Queen Mother's brooches. But perhaps that might have been overkill with the outfit? Register your thoughts below. 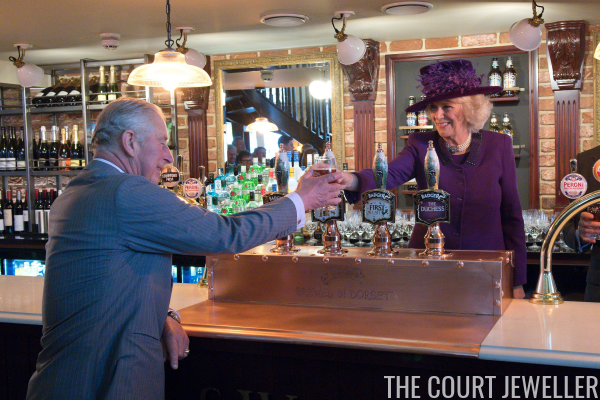 Prince Charles may have been suffering from a cold today, but he certainly seemed pleased as punch to be able share Poundbury (and a pint) with his wife and his parents.